You don't come to the islands to stay in a town! Relax in our tropical paradise away from the traffic and noise of US Hwy #1. When we decided to purchase a home in the Florida Keys privacy and being close to nature was top on our list of requirements. We found the perfect combination on Grassy Key, a small island between Islamorada and Marathon made famous by 'Flipper' and the Dolphin Research Center. On Grassy Key we are close enough to enjoy Marathon restaurants and grocery shopping yet still be able to explore dive sites in both the Upper and Lower Keys! The perfect location has now been turned into the perfect oasis. Special features include a gourmet kitchen that will please the most discriminating chef. Our guests enjoy luxury bedding with quality linens, fluffy towels and bathrobes. Wireless internet service and free domestic phone calls if you must stay in touch with the outside world! After a full day in the sun there is no better place to relax than in the cool fresh water pool surrounded by the lush gardens. Check out the massive coconut and royal palms, the 9' high bird of paradise, the banana and key lime trees, blooming hibiscus and orchids. Just don't lay under the coconut trees! Need more proof? Take a look at our past guest's comments, then check our availability calendar for your vacation dates. Don't hesitate, after 15 years of satisfied guests this home books months in advance. Born and raised in Georgia I have always loved the climate in Florida. I was in awe when I first visited the Keys and drove across the old wooden 7Mile Bridge, I knew then I wanted a home in this tropical paradise. After spending several years looking, I fell in love with White Sands and her previous owners, Pat & JoAnne Ballenger! Thankfully I was able to acquire this home and now have my own slice of paradise to enjoy when I can get away from the horse farm. It's a perfect location on Grassy Key, private and removed from the noisy traffic of US Hwy #1. Close enough to Marathon for grocery shopping and enjoying the conveniences of fine dining. Less than an hour south is the tourism capital of the Keys - Key West is brimming with cruise ships and night life. Directly on the wide open Gulf, sunset views. Dining table overlooks Gulf view, seats 4. Mature lush tropical plants create a private oasis with both shady and sunny areas. This place is perfect! It had everything we needed! All we had to do was grocery shop! It's in the middle of the Keys so everything was within an hour or two drive. We couldn't stop raving about how wonderful this home was! Thank you Katreena for a spectacular vacation! Our family of 4 (daughters ages 12 and 10) stayed at White Sands over spring break 2019. The house was perfect for us. Being our first time to the Keys, I had a list of areas I wanted us to explore from Key Largo to Key West. But it was so hard to leave the house, as it provided so much enjoyment to us. After the first couple days, we cut back our list of places to visit and just relaxed more and enjoyed the wonderful amenities at the house. We all loved the pool and the stunning 360 degree views of the lush tropical landscaping. The pictures can’t capture the full beauty of being there in the present. The dock was another favorite of ours, as we spent hours each day fishing and just walking up and down it looking at all the sea life below. The kayaks were also a hit. My youngest daughter and I were able to fit comfortably on the largest single kayak and took multiple paddles over to the mangroves to explore, which was a very easy paddle from the dock. I couldn’t believe how calm and clear the water was the entire week. We also had a list of restaurants in the area I had researched ahead of time. 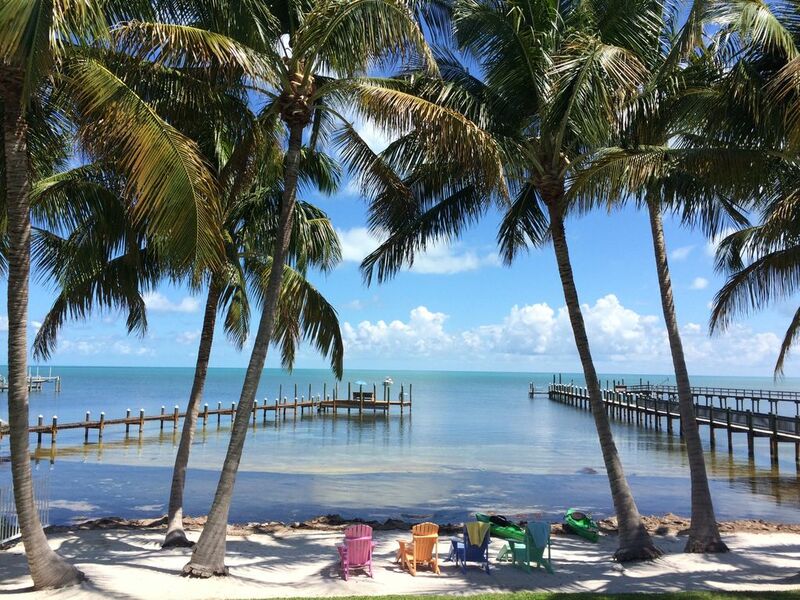 But again, after arriving at the house, we quickly realized we had one of the nicest views in the Keys from the dining room table and back porch, so why bother going out. We ended up grilling most nights while watching the sunset through the palm trees, listening to our favorite music, and enjoying an adult beverage or two on the back porch. Not too many restaurants can top that experience. Overall, we had such a wonderful week at Katreena’s lovely house and had a very difficult time leaving at the end of our stay. We definitely want to get back to the Keys and would absolutely stay at White Sands again and would refer this house to any of our friends. Thank you for being wonderful guests and taking good care during your stay! It’s my favorite place to unwind too! We hope to have you back in the future. It is absolutely beautiful here. Very peaceful. The house is perfect. We had a great between the pier, sandy beach and the beautiful pool. We want to come back next year. The owner is great. She is always concerned that everything is ok. Thank You for taking good care of the home during your stay and for your review! We love this property and sharing it with great guests! My family and I could not have been happier with this rental property. There is so much to do at the house alone. We fished off the dock everyday, went kayaking, cooled off in the pool, went scuba diving, and relaxed on the hammock and deck watching the wildlife in it's habitat. The house is stocked with everything you could imagine. The beds are very comfortable making it for a good night sleep. There are a lot of activities ,restaurants, and grocery stores a short drive down the road. Katreena was so easy to work with and can tell she takes pride in her rental property. Thank you Katreena, our family has found it's yearly holiday spot! Wow! So glad to hear you enjoyed your week in Paradise! Have you penciled in for Dec 2019. White Sands exceeded all of our expectations! What a great spot for just a relaxing getaway! Thank You! So happy to hear that you enjoyed your stay! It’s a special place for us too, we never tire of the beautiful views. We had our best time ever spent in the Keys, and couldn't have chosen a more beautiful place to spend it. The house had everything you could possibly want or need from the well supplied kitchen to the very comfy sleeping accomodations. This incredible palm tree-framed picture is exactly the view we enjoyed every morning from the dining area. We can't even begin to describe how gorgeous the private pool and surrounding landscaping are. We spent many late day hours catching fish from the dock and had some prepared at a couple of our favorite restaurants. Many thanks to Katreena for sharing her White Sands paradise with us and also Barbie for her fantastic housekeeping. Thank you Chris for this review. I am so happy that you enjoyed the home and that you caught fish! We hope you are able to return soon. Thank you for taking good care during your stay. Rates are for 2 occupants, additional fees for 3rd or 4th guest with a maximum occupancy of four. Sorry, this home is not child friendly due to architectural features we cannot change. Safe for children 10 and older.